•NiMHs aren't the best at maintaining a charge over long periods of time, so if your charged pack has been sitting around for more than a week or so, top it off before flying (this is when an automatic peak-detect charger is useful). 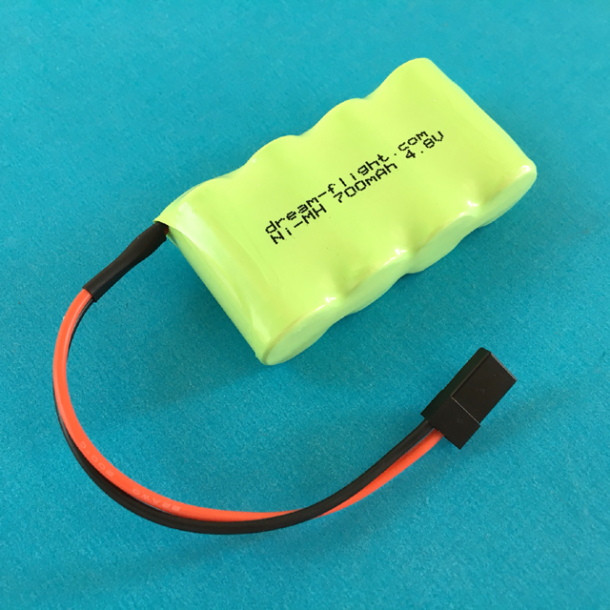 • Charging NiMH battery packs for the first time may require a trickle (slow) charge to wake them up. •Never charge at a rate greater than 1C (typical charging rates range from 0.5C to 1C), where "C" is the capacity of the battery in mAh. Therefore, to determine the fastest charging current in mA (milliamps), simply multiply the capacity of the battery by one. •Automatic charger with NiMH setting highly recommended. •NiMH batteries tend to get warmer during charging than NiCds, so whenever possible, remove battery from aircraft during charging to prevent excessive heating of the battery (mainly during a fast charge). •NiMH batteries should not be cycled. NiMHs do not suffer from the "memory effect" as do NiCDs. You can top NiMHs off at any point during their use without having fear of damaging the battery.